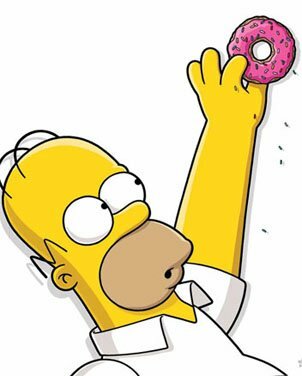 ← Should I Spend Donuts On the Stonecutters Returning Content? 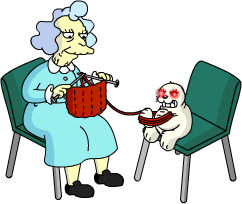 And of course, you’re all wondering, what happens to Hot Flash? Hot Flash remains a separate character and not a costume for Alice. Alice Glick: Maybe I’ll give retirement home living a shot. Old Jewish Man: It’s pretty nice. Plenty of room to shuffle around, and you get three squares a day. Although I prefer my squares rounded so I don’t cut my mouth. Alice Glick: At least I’ll be the most spry person here. Gil: Cha-cha-cha, this place is a dream! Even homier than the homeless center! Alice Glick: What’s that whippersnapper doing here?! I’m supposed to be the ingenue, not him! Jasper: My favorite part of this show is when it cuts to extremely loud commercials — it’s the only thing I can hear. 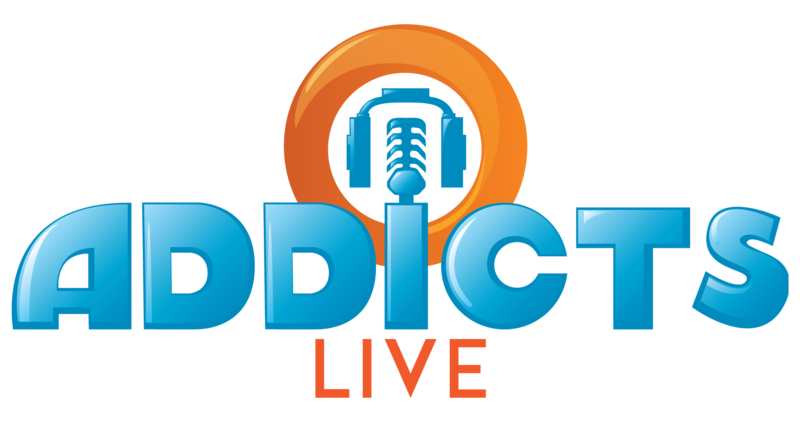 Alice Glick: What is this lame show, dude? I want to watch music videos on MTV, man! Jasper: MTV hasn’t played music videos since before I got my beard plugs. Alice Glick: Give me that remote — I’ll find them! Alice Glick: Ah, who am I kidding, I’m just an old crone. Try as I might, I’ll never be young. Guess I’ll just knit some socks. This is my life now. 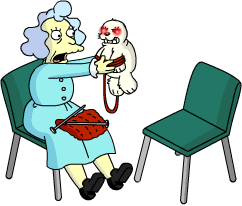 Lisa: Whoa, are you crocheting? Alice Glick: Go ahead, laugh at me. I deserve it for getting old. Lisa: No, it’s cool! I saw it on Pinterest! Alice Glick: Really? A young person like you thinks I’m cool? Alice Glick: A young person thinks I’m cool! Gil: Man, I was killing it in today’s Senior Water Aerobics class! Unfortunately, the slippery floor was killing it too. R.I.P. Mrs. Henderson. Alice Glick: Pff, water aerobics? Give me a break. Gil: You think you can out-youth me? Alice Glick: It’s called being a hipster. You do all the things old people do — knit, use typewriters, listen to records — but you do it “ironically”. Here, have some gross old-timey candy… ironically. Lisa: Wow, since when did the nursing home get so cool? Jasper: Now my gross old man beard is a hipster beard. Old Jewish Man: I found an old film camera in my closet, so I’m super into photography now! Alice Glick:I thought with my newfound youth, dating would be much easier. But it’s so time-consuming going out and trying to get to know people to see if I like their personality. Shauna: Personality? Dating nowadays is about making a snap judgement about someone after two seconds of looking at them. Alice Glick: Are you talking about dating apps? No one in here has a cellphone, so I can’t “swipe right” on them. Shauna: Most of them are in wheelchairs though. If you like the way they look, swipe their wheelchair to the right. Alice Glick: And if I don’t, swipe it to the left and never think of them again! Alice Glick: Well, I instantly judged every guy in the nursing home, and I didn’t get to know any of them. I’m still alone, but I feel superior to everyone I rejected. Modern dating is great! And that’s it my friends, the details on the Alice Glick prizes from the Not Yet Spring Cleaning prize track! For now, what are your thoughts on Alice? Her animations? Questline? Thoughts about Hot Flash not being a costume for Alice? Sound off below, you know we love hearing from you! 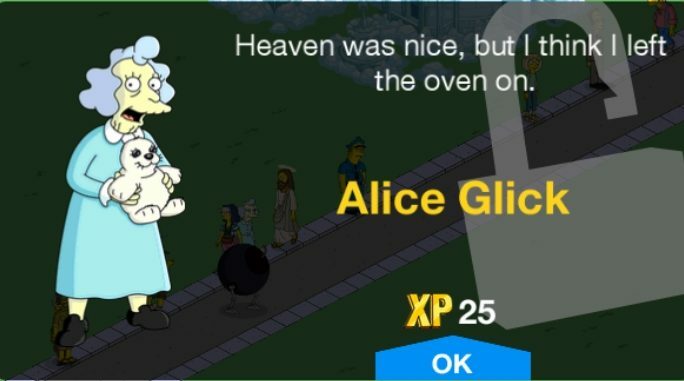 This entry was posted in Buildings, Decorations, Mystery of the Brown House, Not Yet Spring Cleaning and tagged Alice Glick Questline, Alice Glick Tasks, How do I get Alice Glick, Tapped Out Alice Glick Event, Tapped Out Tips and Tricks, Task at Alice Glick's house, The Simpsons Tapped Out, TSTO 2019 Mini Event, TSTO Addicts, TSTO Not Yet Spring Cleaning Update, TSTO Tips and Tricks. Bookmark the permalink. 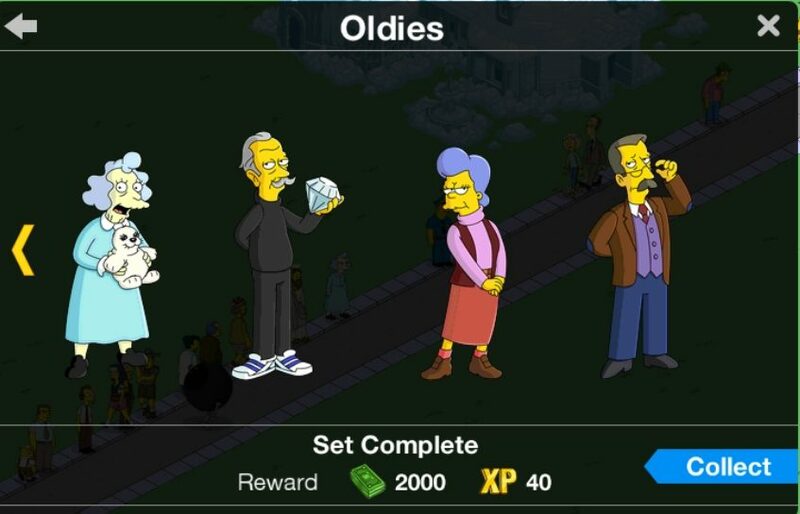 I’m bummed that the Alice Glick quest has ended because I received her character but not she can’t do any of her quest cause I didn’t finish the quest before it ended to get her animation!! How do I make her do stuff now as all of her available quest are locked??!? It says the same for me… BUT if you click on her name, scan down you see the knitting circle. Make her do that, and she sits on a chair & knits with her cat for 8hrs. I can’t get her animation either. I did all the tasks up to part 4 and then the event directed me to her regular tasks. The task menu still showed the animation waiting to be completed. But now that her tasks are done everything is gone. WTH? i have the same problem. i don’t see the animation after unlocking alick glick. also the questline hasn’t been active for 2 days now. xP. I finished the entire questline, but the animation still isn’t showing as complete. Tapping on Alice Glick shows her tasks and none are highlighted as needing to be accomplished. Seems this is a bug? It appears that way. It’s impacting a bunch of players, not all, but a bunch. My best suggestion is to contact EA…or wait for a patch. Is Ms. Glick’s questline still active? My quest line is gone as well; but it’s incomplete. I have no idea how to finish it. I haven’t been able to finish the spring cleaning tasks. When reviewing the summary of this ,I noticed a character named Shauna, I don’t have that character! How do I get her? I liked that Alice Glick has a task at the Original Brown House and 2 tasks at her house as well as having 3 outdoor tasks which most characters only manage to get 2. 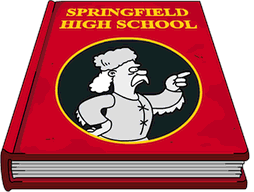 It would of been interesting if her Act Young task went to Springfield University instead of the Retirement Castle. I was surprised that Lisa mentioned Pinterest in Alice Glick’s questline. Is anyone able to get Santa Homie to work post-Christmas? And the task isnt listed under marge? Doesn’t appear until you have all of the land available purchased. Agreed… My Friday Filler today is about just this.